This publication was developed to help parents understand their rights and responsibilities, their child’s rights and the school’s responsibilities to meet the special needs of their child. The guide includes a description of the special education process and what is required of you and the school during each step of that process. Important timelines are highlighted in each section. Access an abundance of resources, including instructional strategies, assistive technology and behavioral supports to help your child succeed. The Virginia Department of Education hopes that you find the information you need, whether you are new to special education or looking for the latest news, research, and resources. Parents and families can make a difference in their child’s education. The providers and resources on the list are from a variety of sources. The list is being provided as a courtesy, for information only, and the user should understand that no assurances or guarantees regarding the providers on the list are being made by providing this list. Arlington Public Schools neither endorses, approves nor recommends any specific provider, resource or organization listed below. This list is not inclusive of all community agencies, services, or organizations that provide the particular service, and the omission of an agency, service, or organization from this list does not imply disapproval. It is the responsibility of the user of this list to determine whether any of the content is of value to them and whether or not the agency, service, or organization meets their specific needs. Please be aware that sites are sometimes relocated. If you find a broken link, please contact Kathleen Donovan. http://www.arlingtonfamilies.com — A site that links parents and caregivers to valuable online resources about what’s happening for families in Arlington, Virginia. Find a playground, meet other parents in a workshop, learn about school options, discover something fun to do over the weekend, or get connected to practical parenting ideas. Dental Tool Kit: http://www.autismspeaks.org/community/family_services/dental.php –Autism Speaks recently released a new Dental Tool Kit to help parents promote good, life-long oral health care habits for their kids with autism. The free kit, which includes both a video and a downloadable printed guide, features tips for improving oral hygiene at home, as well as information about how parents and dental professionals can make a visit to the dentist’s office less stressful and more productive. Horner, R.H., Sugai, G., & Anderson, C.M. (2010). Examining the Evidence Base for School-Wide Positive Behavior Support. Focus on Exceptional Children, 42(8). 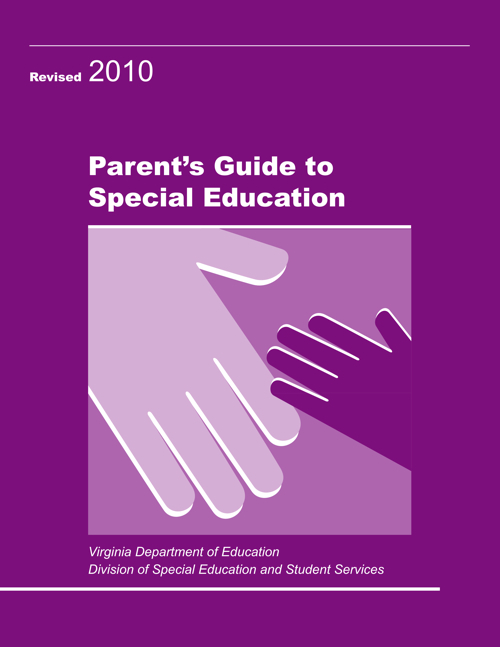 Virginia’s Guidelines for Educating Students with Specific Learning Disabilities (PDF) Also available as Accessible Word Document (Word) – A resource for teachers and administrators as they address the educational needs of students with a Specific Learning Disability (SLD). These guidelines offer an overview of best practices for educating individuals with SLD. Parents of children with SLD may find this document useful as well. Specific Learning Disability Supplementary Guide Dyslexia: Frequently Asked Questions (PDF) – This document is designed to be a resource for teachers, administrators and parents to address the educational needs of students with dyslexia. It provides information on the resources and services available to students with dyslexia through general education, as well as any student with dyslexia who may qualify to receive services as a student with a Specific Learning Disability (SLD) under the Individuals with Disabilities Education Act (IDEA) or under Section 504 of the Rehabilitation Act of 1973 (Section 504). Arlington’s Second Chance is a free substance use prevention and early intervention program for middle and high school students whose parents/guardians live in Arlington. It is especially designed to help students in early stages of drug or alcohol use who get caught for the first time at school or by the police in possession of or under the influence of alcohol or marijuana. Parents can also refer their teen. APS Resource Page: In Crisis/Need Help Now? When My Child Needs Additional Help, What Do I Need To Know?